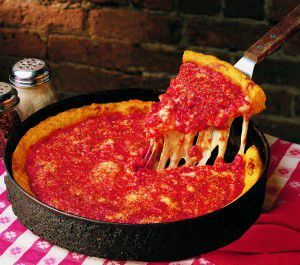 Nothing says “I love you” like a Chicago style deep dish pizza from Gino’s East. While pizza is great for showing someone how much you care, it can also be good for those moments when you need to say “I’m sorry”, “Congratulations”, or even just a “I noticed you were hungry” kind of day. Whatever your pizza occasion, Gino’s East of Chicago has mail-order pizza delivery that ships throughout the continental U.S. (inquiries about Alaska and Hawaii see here). Take a look at our top three suggestions for surprising friends and family with their favorite Chicago-style deep dish and other classic appetizers. After College Finals. Or after any test for that matter. Your son or daughter has been slaving away at the library and you want to reward them for their hard work with what else? Gino’s East deep dish pizza. Imagine the look on their tired faces when a frozen deep dish arrives via FedEx to their dorm. You go, Glen Coco. You’ve just made your kid’s day. Heck, throw in a 16 pack of mozzarella sticks for the post-finals party that’s going to be happening on campus. After a rough breakup. Have a friend who’s been dumped? While she’s burning all of her pictures and possessions that remind her of ‘that guy’, send her a pizza to ease the pain. If you can’t be by her side, a pizza is the next best thing. Flaky crust, sausage patties and delicious cheesy goodness may be the best cure for a broken heart. Trust us. For new homeowners. Considering they won’t be fully unpacked for weeks, mail-order Chicago pizza will keep your best pals fed and full in their new abode. Send it their way after a long day of moving–you’ll be the first one invited over to use the pool.